Well, here I sitting on my big suitcase on the train from Gatwick Airport to Kampala, only kidding, to Polegate my nearest railway station to home. It’s been a long day following a short night’s sleep. Bedtime was after midnight and the alarm was set for 03.30. Robert, our super taxi driver was picking us up at 04.30 to take us the short journey to Entebbe. Robert had picked us up from Kampala on Wednesday evening and we reached the hotel sometime after 11.00pm. There was an emotional parting at the airport. Lillian and I have created an amazing bond during our two months together. I had to keep reminding her that it’s not goodbye but ‘see you next time’. Even so it was a wrench parting. The flight started slightly early at 06.45am and was short and sweet. From Kigali in Rwanda to Brussels and then to Gatwick was long long long. But, here I am nearly home. More blog post tomorrow, your weary blogger. Saying goodbye seems so permanent, so instead I’ve been saying ‘see you next time ‘. As I sit here on a bus heading for Kampala I’m happy to think there will be a next time. This trip has been extra expensive due to the tools that were handed over. Many more tools could be added to the relatively basic kits that the three friends now have. I’ll be looking at ways for fund raising once I have my feet back on the ground at home. I have no regrets about this trip. It has been a life changing and life enhancing experience. During this time I have been welcomed into the families of my three friends, that’s one hell of an extended family. The photo with this post is Lillian, her mum (I only know her as mum), Willy and Mark (Lillian’s cousins who are staying with mum. Willy has been staying there during Senior School and will soon be off to university. Mark has just started Primary School close by but his family home is some distance in a small village). It’s not goodbye to the blog either. There’s more to tell and I intend to add more details in the next few days, and even then the story will not come to a complete end. I mentioned yesterday that Lillian had gone off on a secret mission. The answer can now be revealed. 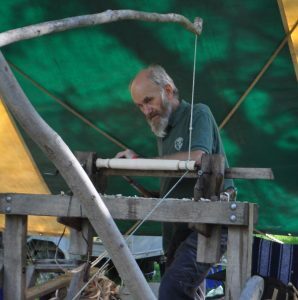 We have created a new pole-lathe and green woodworking association. So far there are only two members, but we do have our own polo shirts complete with our unique badge. I had a cunning plan enter my head earlier about opening up the membership. Watch this space for further details. Christian posters, crucifixes and rosary beads in shops, offices and other places. I think there is a ready market there for Lillian. My crucifix was ten inches high and six inches wide. I kept the decorative beads fairly simple. After a chat about this exercise I left Lillian to carry on. Julius had joined us late morning and was keen to observe Lillian and myself at work. Lillian finished her crucifix without any problems. During that exercise we heard a strange buzzing sound gradually getting louder. We soon realised it a swarm of bees coming in our direction. When they arrived they quickly settled on the roof of the building next to us. Lillian and Julius were keen to keep their distance. I was more interested in keeping the work rolling on. Ultimately, Lillian and Julius vacated the area after Julius was stung whilst swatting at a bee. Then it was Lillian’s turn to get stung. I’m not phased by bees and wasps and carried on working, and didn’t get stung. Eventually the bees settled and were not a problem. Julius returned the tenon of leg for his single leg stool. He also made a quick seat for it. He was really pleased with the result, and so he should be. Willy had been invited along as he had no work for the day. He helped in many ways. Between us we completed a high chopping block, legs for the shaving horse and a few other odds and ends. Lillian and I had a quick run through various techniques that we had used during the last two months to jog her memory. And with that it a final clearing away session before heading home pretty well shattered. The main target for today had to be finishing Lillian’s stool. After setting up the equipment I set about preparing the top pieces for Lillian’s stool whilst she went off on a secret mission which will be revealed tomorrow. The stool seat material was too thin as a single piece, so we prepared a second piece slightly smaller in size. Holes for the legs were bored and screw holes drilled. Sharp edges were removed and the wood generally tidied up. I left the rest for Lillian to do. I then set about sawing a piece of tree trunk to length for making into legs for the shaving horse. After cleaving and axing I set about shaving each piece to tidy it up and to taper the top ends down close to one and a quarter inch. I then refined each leg until it fitted into a homemade gauge. These should / must be finished tomorrow. Final task before Lillian returned was to cleave and shave two billets ready for the lathe. So, Lillian returned and she set about returning the ends of the legs and stretchers. For non green woodworking folk green wood shrinks when it dries. If the wood has been turned it will go oval when it dries. As such it needs to be ‘returned’ to make it round again. Oval tenons do not fit well into round mortises. We then set about joining both seat pieces with glue and woodscrews and boring the holes into the main seat through the reinforcing board. Then, finally we measured the centres on the legs to receive the stretchers. After boring the holes and a final check over we did a dry assembly. This went well, so adhesive was applied. The final assembly also went well and a fine stool had been created. By now it was turned seven pm and set about putting away for the night.